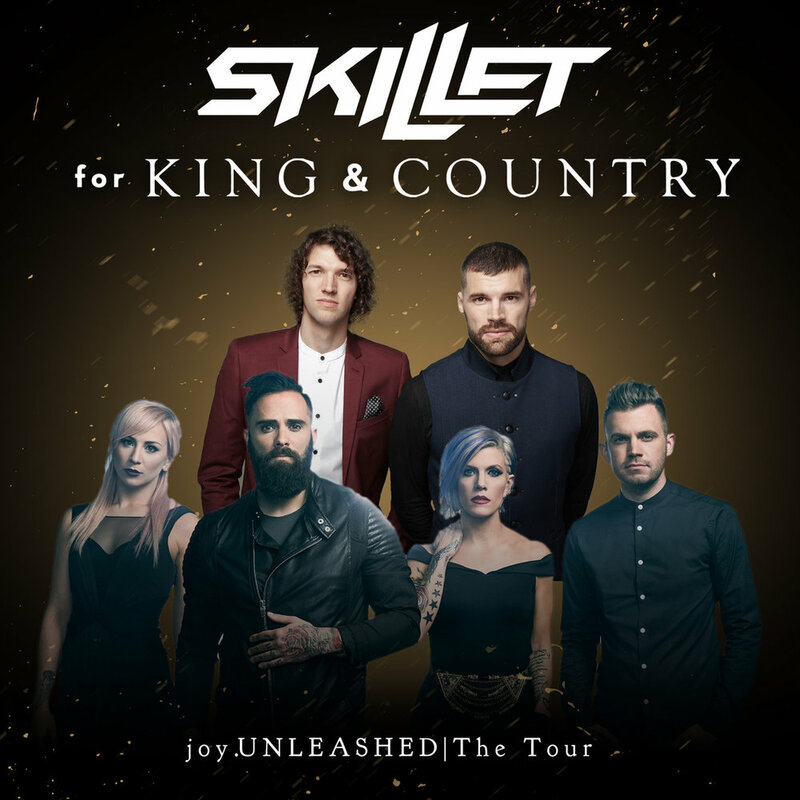 Nashville, Tenn. (Jan. 23, 2018) – Skillet and for KING & COUNTRY unveiled that they will join forces for "joy.UNLEASHED | The Tour" stopping in over a dozen markets from mid-April through early May. The unprecedented double-headliner line-up will visit San Antonio, Cedar Rapids, Huntsville, Orlando, Miami and more. "joy.UNLEASHED | The Tour" marks the second time these two critically-acclaimed, top-selling acts share the stage for an incredibly theatrical, high energy and laser/pyro-filled show. Giving listeners the first chance to access tickets, a Spotify pre-sale will begin at noon central today, Jan. 23, followed by tomorrow’s Ticketmaster pre-sale at noon CST. "joy.UNLEASHED | The Tour" public sale will be unveiled on Friday, Jan. 26 at 10 a.m. local time. VIP tickets include early entry with a crowd-free merch shopping experience and a pre-show Q&A with Skillet and for KING & COUNTRY. "Very excited to be touring with my friends, for KING & COUNTRY!" shares Skillet's John Cooper. "We have been talking about it for several years. We have even shared the stage performing songs together. But finally we are joining forces for our own tour. It will be an uplifting, energetic, exciting show where fans will get to see something they have never seen from both acts before." "We have so many memories when it comes to our friendship and history with Skillet," explains Joel and Luke of for KING & COUNTRY. "As teenagers we remember watching their sets from side of stage. They headlined the very first tour we were ever on! It's a real honor and joy for us to have the privilege of touring together." Skillet has cemented their place as one of the 21st century’s most successful rock bands. Selling more than 12 million units worldwide, the Wisconsin quartet have received two GRAMMY® Award nominations and won a Billboard Music Award for the double-platinum certified Awake. Their double-platinum single “Monster” currently has over 118 million plays (and counting) on Spotify, earning the distinction of becoming “the best-selling digital single in the history of Christian Music” and continuous mainstay on Billboard's Year End Chart. 2013’s Rise bowed at #4 on the Billboard Top 200 upon release and received resounding and eclectic acclaim from the likes of USA Today, New York Times, Revolver, Loudwire and more. Their latest album, Unleashed, debuted at #3 on the Billboard 200 and topped Billboard's Top Christian albums chart. The first single “Feel Invincible” went to #1 on the Rock Radio chart, and earned RIAA Gold Certification. The track “Stars” was featured in the soundtrack for the motion picture The Shack, released last March. Stemming from Unleashed, Skillet was nominated for 3 additional Billboard Music Awards and their songs have been used by the WWE, Marvel, ESPN, NHL, MLB and the NFL to name a few. While steadily headlining their own tours in addition to performing with some of the biggest rock acts in the country, their live show has become a global force to be reckoned with, selling out shows in London, Moscow, St. Petersburg, Warsaw and more.